“The Health Needs of Young Women: Applying a Feminist Philosophical Lens to Nursing Science and Practice” by Candace W. Burton, PhD, RN, AFN-BC, AGN-BC, FNAP is now featured on the ANS website. In this article, Dr. Burton calls for philoophic underpinnings that strenghthen nursing’s unique identity and contributions to the care of adolescent and young women. The article will be available at not cost while it is featured, and we encourage you to contribute your responses and participate in discussion of these ideas! experiences of adolescent and young adult women. It is also a companion piece to my work on the theoretical foundations of this work “Relationships and betrayal among young women: theoretical perspectives on adolescent dating abuse” (Burton, Halpern-Felsher, Rankin, Rehm, & Humphreys, 2011). I am especially pleased to have this article featured, because it helps to address some of the issues I have encountered as an instructor at the doctoral level in nursing. There is a great deal to learn in the process of becoming a nurse scientist and scholar in the 21st century, and the plethora of methodological and foundational information can be overwhelming to doctoral students. As a result, there is often little time or attention given to developing the self-concept of the scientist. Placing one’s area of interest and scholarly focus in the context of the philosophy of science and the theoretical lexicon is critical to both understanding the state of the science and to developing a scientific identity. For those scholars who aspire to a career in nursing science, this is fundamental to recognizing oneself as a part of the scientific community and to developing standing as a independent researcher. The application of philosophical analysis within nursing science represents one of the most important functions nurses perform: the act of translation. At the bedside, it is often nurses who are called to translate care orders, lab results, and prescriptions into the best possible restoration of health and function to a patient. In our science, we also translate what we do clinically into the generation of evidence. Integrating philosophical contextualization of that science into our work as scholars creates a translational bridge between what we do and why we do it. I believe that this is often what we miss in educating ourselves as researchers; we may be inclined to gloss over the historical roots of research and focus instead on its application because that is what we gravitate toward as clinicians. Nursing science is unique and therefore deserving of a unique place in the scientific repository. Our science, perhaps more than any other, combines multiple means of data gathering with direct experience and measurement. Identifying the philosophical roots of our endeavors helps to cement the distinctive contributions of nursing science into the continuum of discovery. 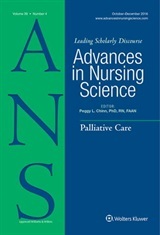 In developing this paper, I intended to both demonstrate the act of performing such an analysis and to illustrate the value of recognizing the many ways in which nursing science is a part of the larger scientific world. My area of interest is sparsely peopled, and I understand the challenges of feeling as though one is wandering without guidance through the literature! I hope that the publication of this work will make it a bit easier for those who are also interested in the health of young women and in the philosophy of science to discover where we have been and where we are headed. ← ANS Celebrates Nurses Week with Latest Issue!